During the bitter winter months, a warm bowl of Moscow Russian Jewish Penicillin Chicken Soup hits the spot. Root vegetables are a staple of Russian cooking with many chicken soup recipes including potatoes, carrots and onions. Dill and laurel paired with fresh pasta, or lapsha, make this dish as healing as any Jewish Penicillin recipe. Jewish Penicillin, or chicken soup, is an ideal feel good meal for treating cold in pregnancy. 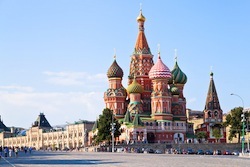 Moscow has a strong Jewish community with Kosher stores and restaurants located throughout the city. Restaurant Yonah and Kosher Express are two hot spots in Jewish Moscow for authentic Israeli dishes. There are two synagogues located in Moscow. Crack egg in a medium bowl and beat well. Add 1 cup flour and mix. Add warm water slowly until the flour / egg mixture turns into a tough dough. Coat a rolling pin with flour and roll out dough to 1/8 inch or thinner if possible. Cut into small pieces of lapsha. Spread on cutting board dusted with flour and dry for 30 to 45 minutes. Place chicken leg and wing in a medium stock pot. Add enough water to just cover. Add small carrot and onion whole. Boil until chicken is done. Chop potato, carrot and onion in small pieces. Remove chicken, debone and chop meat in chunks. Remove small onion and carrot and discard. Add meat back into broth. Add chopped carrots to broth and cook for five minutes. Add potatoes and onions and cook five more minutes. Add lapsha, dill, parsley, laurel leaf and pepper and cook five to seven minutes. This recipe is for a small pot of Russian Jewish Penicillin. A whole chicken can be used in place of the chicken leg and wing if the recipe were to be doubled or tripled. Spices are to taste so it is best to start small with a pinch and add more from there. Women fighting a cold in pregnancy may wish to tailor spices to fit pregnancy tastes. If dill is too strong, it can be left out, for instance or replaced with another comfortable spice.